Another season has gone by, and Code S season 4 is around the corner. I will keep up the tradition to have a race distribution for every GSL Code S season. The race distribution remains the same with 10 Protoss, 13 Terran, and 9 Zerg. The metagame is considered healthy since the race frequency is quite well distributed. With that being said, Terran still has more than the other two, but that is just marginal. 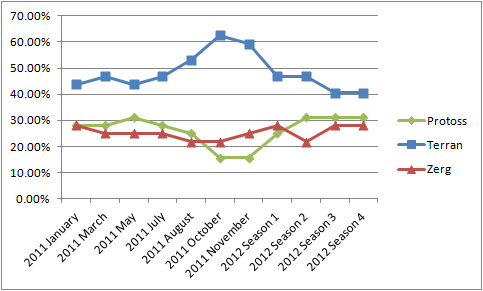 Interestingly, Terran is not as competitive outside of South Korea and the other two races are much better represented. You need to be a Korean Terran to be a tier 1 Terran. Korea WCS certainly doesn’t support that statement. Overall, I’m quite satisfied with the Terran players in the pool. Almost every notable player is in there, with the exception of aLive and Maru. Group E and H are the terran groups, with three Terran players each. 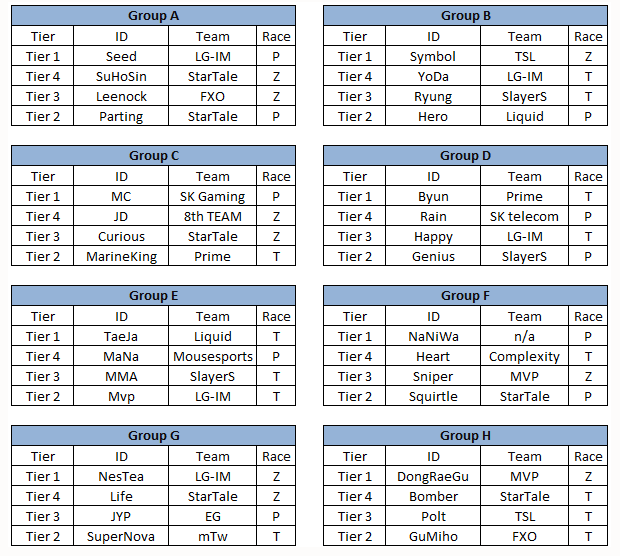 Group E is considered the group of death with Mvp, MMA, Taeja and Mana. Mana is clearly the least likely player to move out of the group, but MMA and Mvp aren’t that good in their TvP too. Recently, Taeja is on a roll and he has been labelled as the current best player in the world. He certainly is a safe bet to make it out of the group. One just cannot count Mvp out in GSL, and I rate him to have a better chance to make it out than MMA. MMA has not been playing many tournaments recently and the internal SlayerS issues just won’t help. Group E is more straight forward. DRG is going to make it out but the problem is who is going to advance with him. 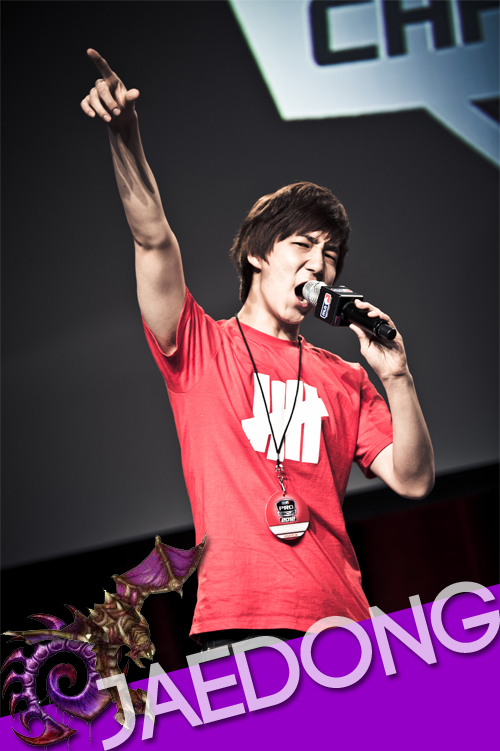 I rate Bomber, Polt and Gumiho equally for TvT. Kespa has agreed to participate in GSL after much negotiation. I don’t know much about Rain but JaeDong certainly gets his fair share of attention. The whole world will be watching if the elephant is going to trample over the GSL players.